Northampton director of rugby Jim Mallinder has confirmed fly-half Ryan Lamb will join Leicester Tigers at the end of the season. Lamb, 26, was signed from London Irish in 2011 and has made 31 appearances for Saints, scoring 238 points. 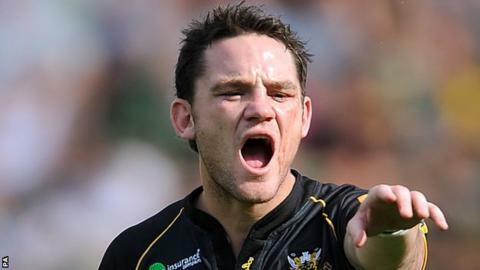 "I've spoken to him and he's determined to help us achieve what we want to this season," he told BBC Radio Northampton. "He's still a really important part of our squad for this season, then we'll wish him well at Leicester next year." Mallinder's confirmation of the deal came after Leicester director of rugby Richard Cockerill recently expressed his interest in the Gloucester-born playmaker. Cockerill told BBC Radio Leicester: "With George Ford leaving we need cover at 10. We need more goal-kickers within the squad. "He [Lamb] is one of the guys that is available, along with several others. There is a little bit of a merry-go-round on the fly-half front across the Premiership. "There are plenty of others and there are a few other options outside the Premiership as well."